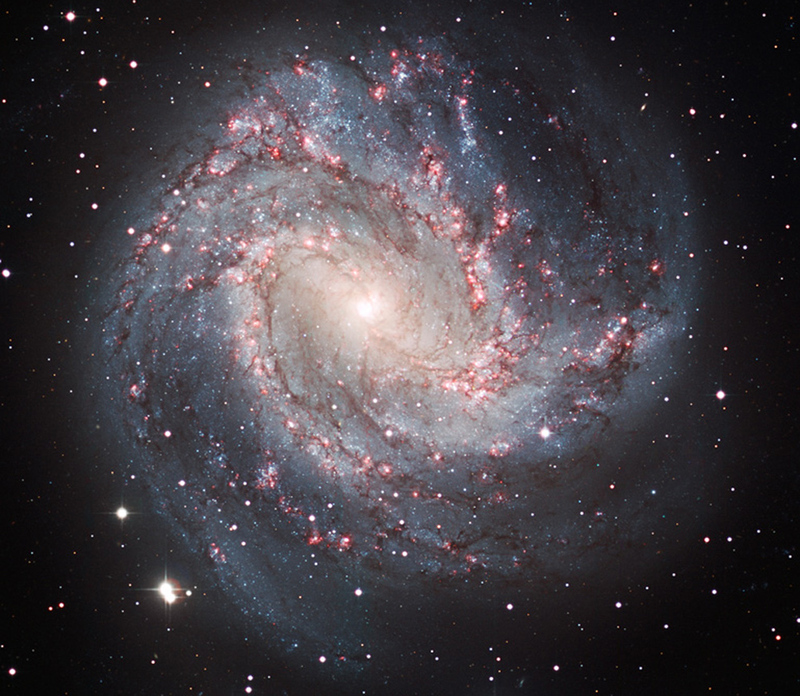 Image of the galaxy M83, taken by the European Southern Observatory’s Wide Field Imager on the ESO/MPG 2.2-meter telescope at La Silla, Chile. What’s on the other side of space? Why is there so much of it? Space, that is. Why so many galaxies? Solar systems? Planets? I have spent a fair amount of time in two-way conversations with the Holy Spirit about these questions, and even asked him why he bothers to answer me. “Because you asked,” he said. So, I said, you would answer anybody who asked odd questions like these? Some of the answers were long and detailed, some quite technically-oriented. Some answers were simply common sense, logical, after he laid some groundwork for me. Eternity is a concept we have trouble understanding. It’s a long time. Distance is another hard concept. Light years. Not to mention dimensions. But companionship is not hard to understand. Fellowship. Friendship. Parent-child relationship. Desire, and desire to share knowledge, understanding, creation, achievements. We sometimes don’t attribute those to God, but we should. And as I meditated on those answers, I began to slowly realize and understand why conversion is necessary. We believers think of that word conversion as having a purely spiritual definition. Changing a person’s allegiance, his behavior, his character. His essential nature – from what he is naturally, to something other. But the word also has a physics application and definition. Converting an engine to run on diesel fuel instead of gasoline, a simple example we can visualize. A more “elemental” example of conversion, however, would be that which occurs when uranium becomes plutonium in a nuclear energy plant. Here the physical atomic structure has been fundamentally changed. That’s more like what happens to a human being when God changes him. Why does a human being need to be fundamentally changed in the first place? Accepting Jesus as both rescuer and manager could have just resulted in a more likable demeanor. An infusion of know-how in some field or other. Some practical talent, acquisition of money or influence, something useful for the duration of a life spent here on planet earth. And it might do one or more of those things, but they would be in addition to the molecular change that takes place, the one that will allow human beings to survive in an off-world environment… will allow them to survive, adapt, thrive, explore and discover for many times the normal earth lifespan. Surviving as a human being after this planet has undergone major geologic stressors will be challenging. Surviving a thousand years and a global insurrection following that will be more challenging. Conversion to something other will come in very handy, no doubt. You are currently browsing the Speaking of heaven blog archives for November, 2009.